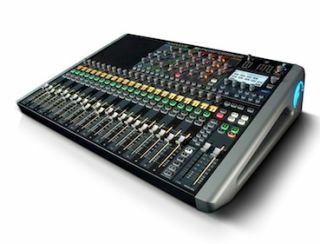 Harman’s Soundcraft has launched the Soundcraft Si Performer range of mixers, which, with integrated DMX functionality, adds lighting control options to the powerful audio feature set. The Si Performer builds upon the Si Compact range to which it bears a likeness, providing almost twice as much DSP power and increased functionality, with an input capacity of 80 inputs to mix on all models. The built-in I/O offers Si Performer 2 with 24 mic and eight line inputs, and the Si Performer 3 with 32 mic and eight line inputs, plus the four FX return channels. The provision of two option card slots allows I/O expansion via any of the Soundcraft stageboxes and option cards from the Soundcraft ViSi Connect range, giving the possibility of patching up to 80 inputs to mix, or from CobraNet, AVIOM or AES inputs via the appropriate cards. The unique integration of a DMX512 port offers core lighting control. The first release of software provides four scene masters (A-D) with associated slave channels on the ALT fader layers, individual color intensities or parameters are set on the slave faders with an overall master level fader, which itself may be assigned to any of the main fader layers for simultaneous access to audio and lighting levels. To automate the process, DMX settings may be stored alongside audio settings in the snapshot system, so both may be recalled automatically by a single button press or via an external MIDI command. With selective isolation, snapshots with just audio or lighting parameter changes may be recalled. The Si Performer features fully-parametric 4-band EQ as standard on all input channels, and as usual on Soundcraft’s digital range, BSS graphic EQs on all bus outputs. This is in addition to the already standard filters, gates, compressors and delays on all inputs, compressors and delays on all outputs, which when calculated delivers the equivalent of over 220 rack units of processing in a tiny footprint. Fourteen mixes may be configured in various combinations of mono and stereo to a total of 20 mix busses; great for mixing in-ears and wedges in a monitor situation. These busses are supplemented by four stereo matrix mixes, four dedicated FX busses, and three master Mix busses which offer true LCR mode mixing make the buss structure immensely powerful. Each channel features a custom LCD screen to show identifications such as channel name, assignments, graphic EQ frequencies and DMX data, plus signal metering. The Si Performer will be controllable from the Soundcraft ViSi Remote iPad app along with the Soundcraft Vi Series, Vi1 and Si Compact consoles.